Evernote says this is part of a bigger push to make the app available on multiple platforms, something that Evernote itself aspires to achieve with its own personal information management platform — although some platforms are clearly proving to be more popular than others. 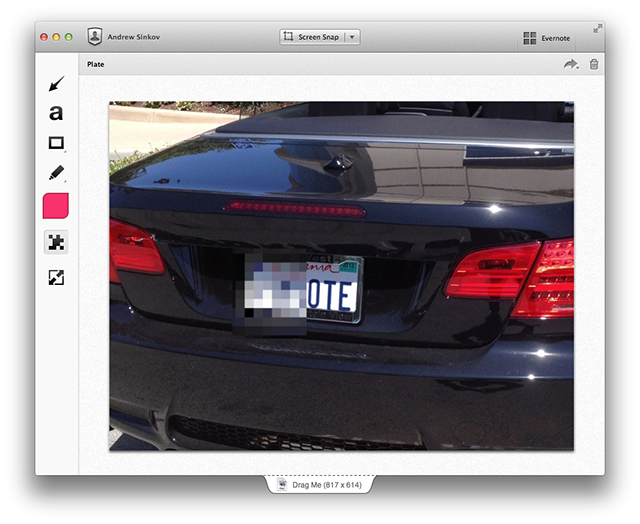 Skitch had already been available as a Mac and iPad app. Putting Skitch in line with Evernote itself, expect versions for Android, Windows Phone and more coming up. New features. One of the coolest features, and a surprise, really that it wasn’t there before, is the ability to pixelate images, an essential tool for obscuring personal information in documents and sort-of hiding unwanted details in photos (see picture below). There’s also now a highlighting tool in addition to the drawing and boxing tools that existed in the previous version. Evermore Evernote features. It’s also giving the new Skitch a much stronger integration with Evernote’s other features, some standard and some new ones. On the more basic side, whatever you edit on one device will automatically be accessible on another, and that will extend to the ability to edit files across those different devices. That is now getting augmented with the ability to share to Twitter and Facebook directly. In terms of new features, Evernote is also making your Skitch sketches more searchable: they can now be found using image recognition techniques but also by handwriting in the images, perhaps a sign of some of the technology from Penultimate (another Evernote acquisition) coming into play. The app is now, more than before, also being used as a lever to encourage more Evernote signups (account numbers are currently pushing 40 million): Evernote points out that users won’t be required to have Evernote accounts to use Skitch, but without it they won’t get all the full monty of synchronizing, sharing and search features. Evernote’s also posted a video sketch to take you through the new Skitch.